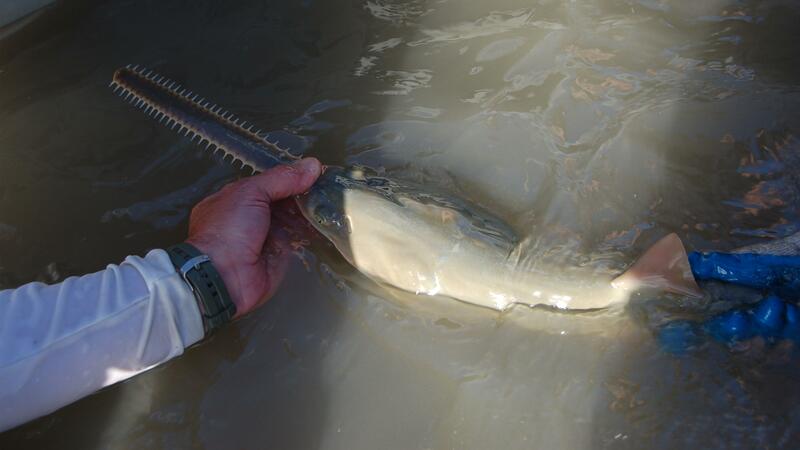 Strange and prehistoric-looking, Smalltooth Sawfish were once coveted by anglers as popular trophy fish. 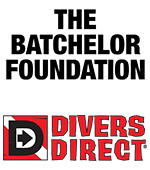 But habitat loss and overfishing have greatly reduced the animals’ range and landed them on the endangered species list in 2003. Historic records report sightings of the fish as far north as New York and west to the Texas-Mexico border. 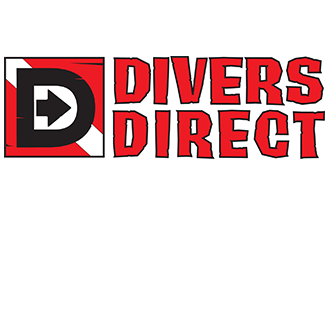 Today, the animals, which are related to the sharks, skates and rays, are limited to South Florida. 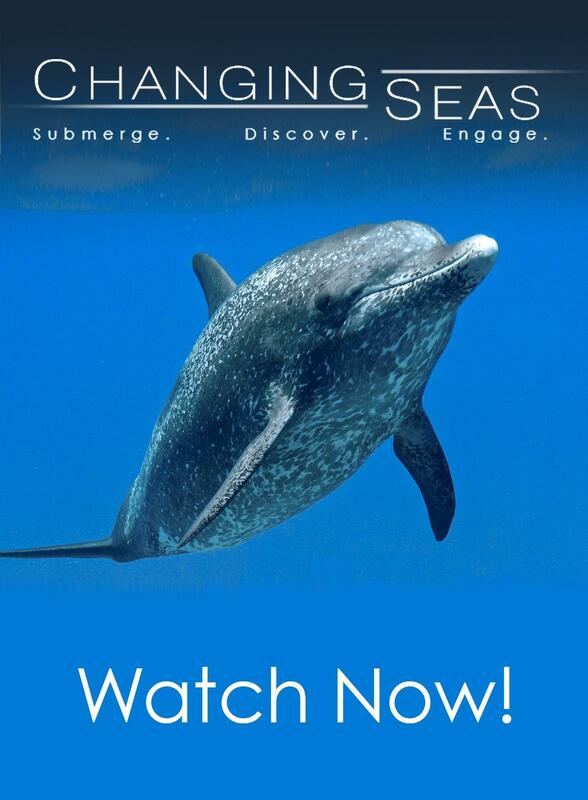 Now scientists are conducting research to save the species. 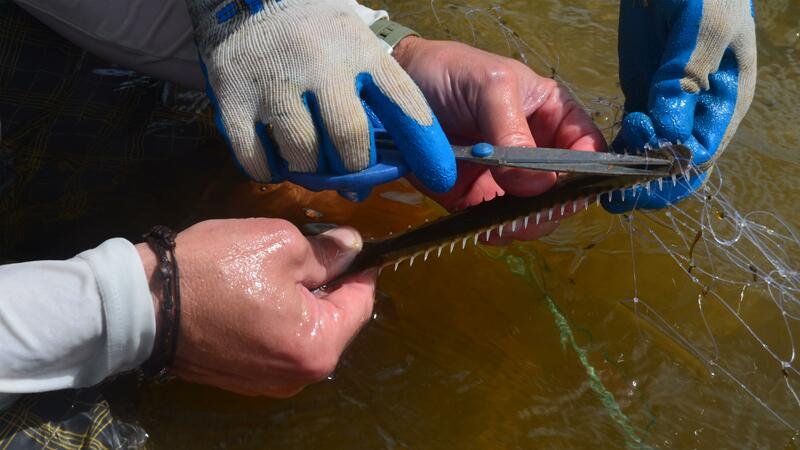 Little was known about Smalltooth Sawfish when they became endangered, so experts are conducting basic research about their life history, as well as tracking their movements using satellite and acoustic tags. 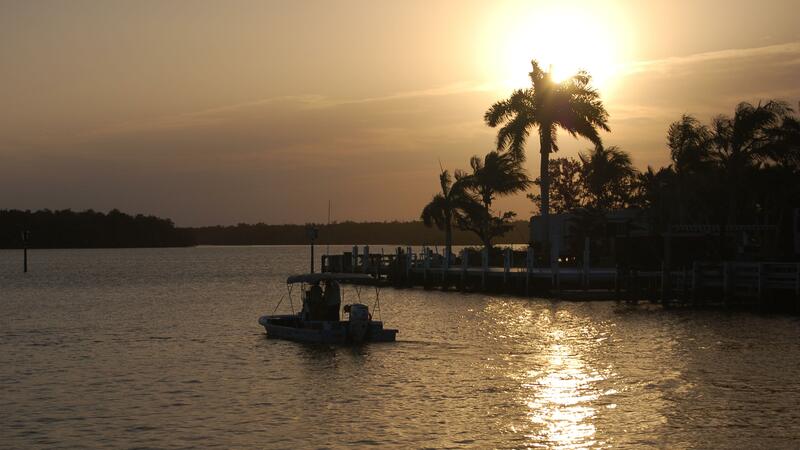 Cameraman Sean Hickey gets on the boat with researchers from Florida State University’s Coastal and Marine Lab who study sawfish in Florida Bay. 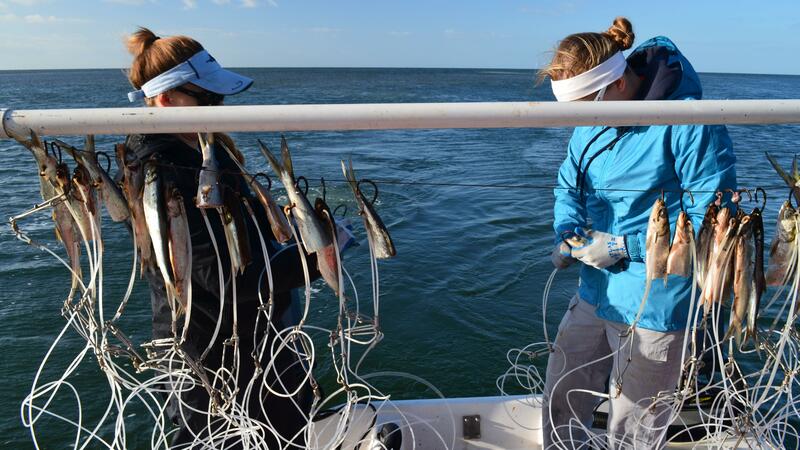 The researchers bait hooks with ladyfish. 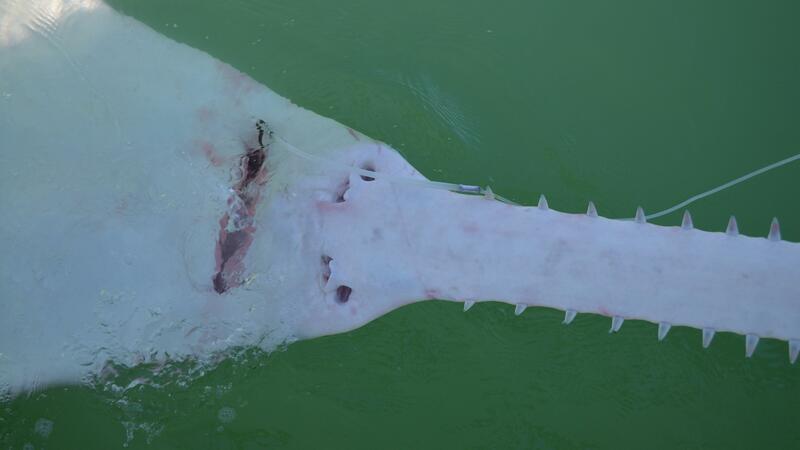 Adult sawfish are caught with scientific long lines. 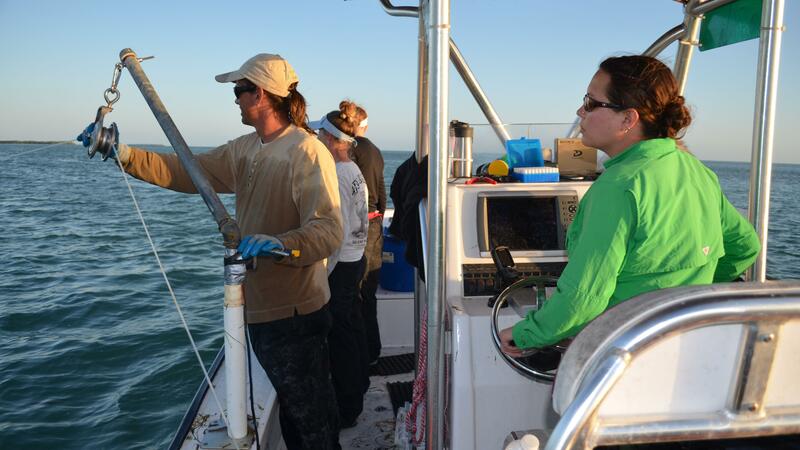 While fishing for sawfish the scientists catch a lot of sharks. The animals are released after a few basic measurements are taken. Dr. Dean Grubbs and his team haul back the line after letting it soak for one hour. 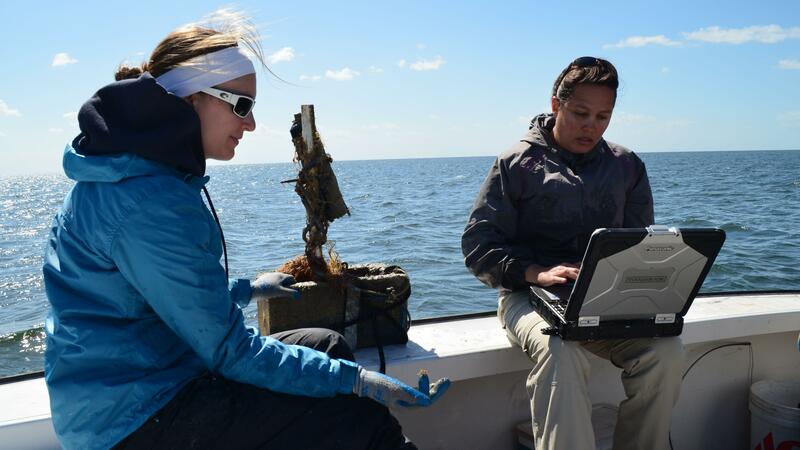 Experts download data from an accoustic receiver in Florida Bay. 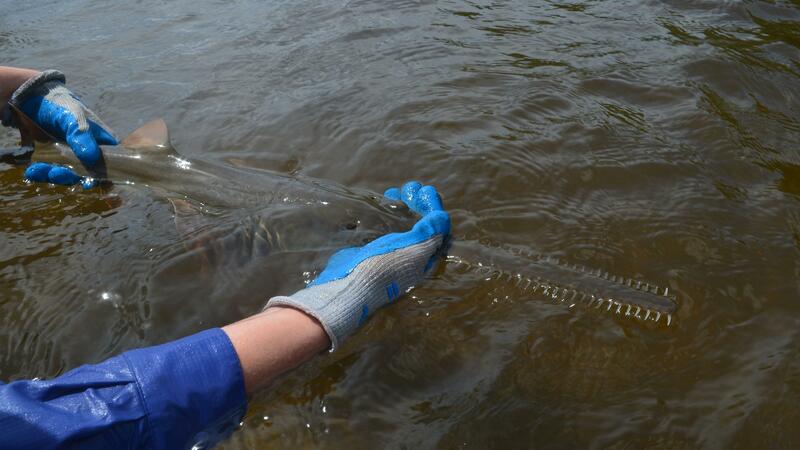 Each time a tagged sawfish swims by one of these receivers it records the time, date & animal's ID number. 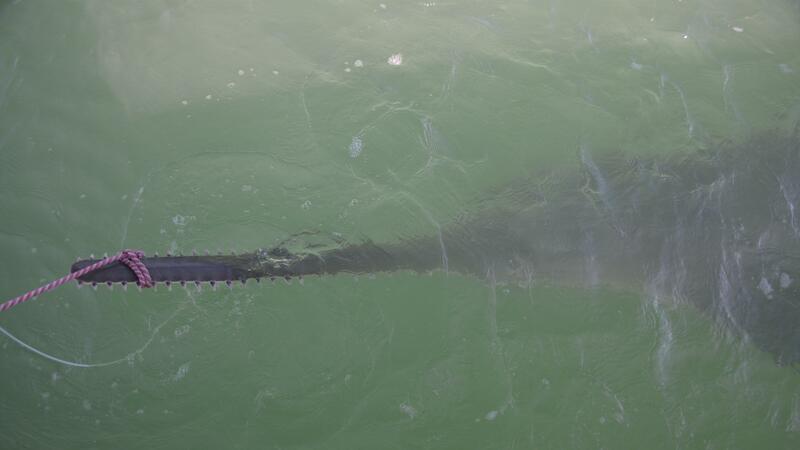 This adult sawfish was more than 14 feet long. 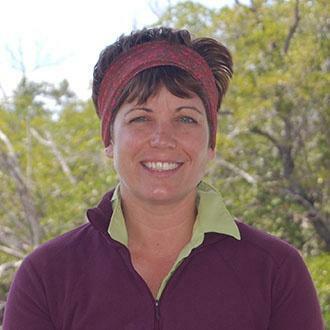 The saw-like appendage, called the rostrum, is secured with a rope before the scientists start working up the animal. 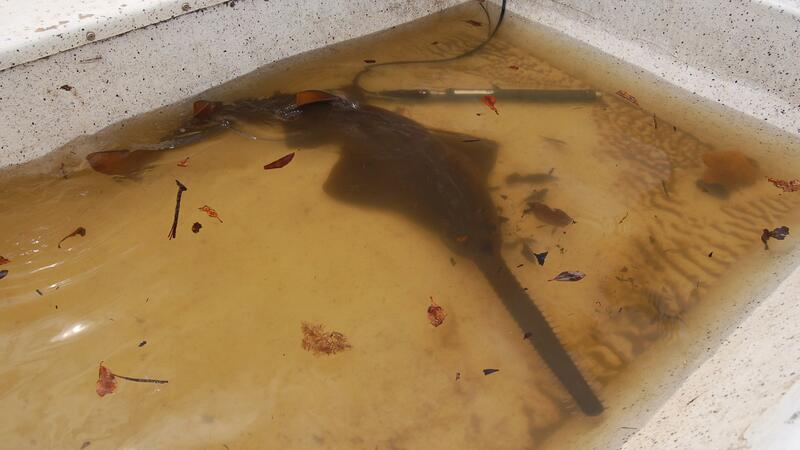 The rostrum of this sawfish was nearly four feet long. 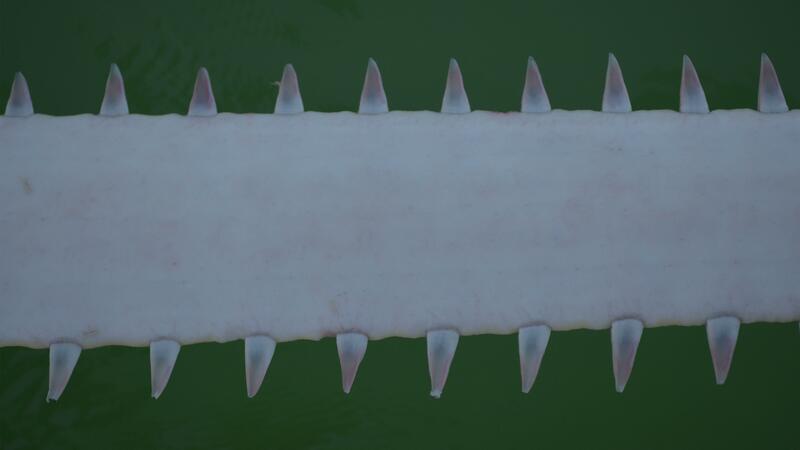 The underside of the sawfish with the hook still inside the mouth. The underside of the rostrum. 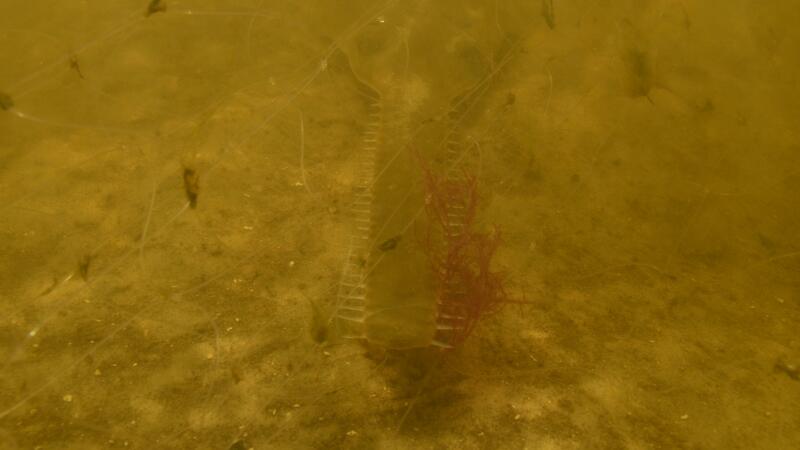 Mangroves are an important habitat for sawfish, especially in the animals’ juvenile stages. 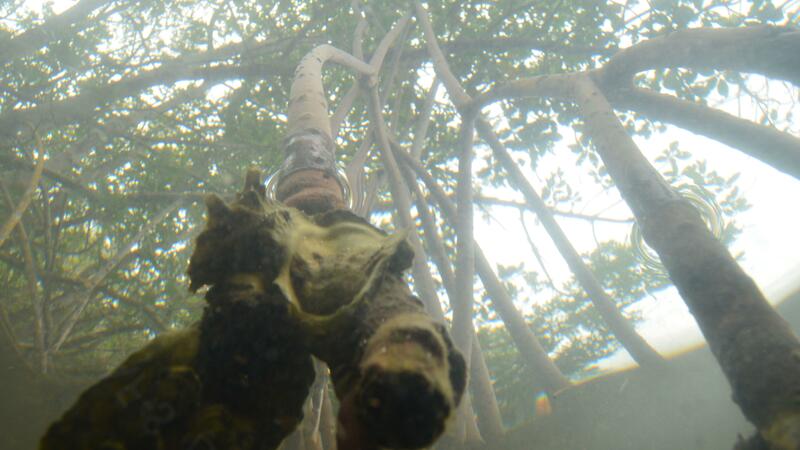 A red mangrove prop root. 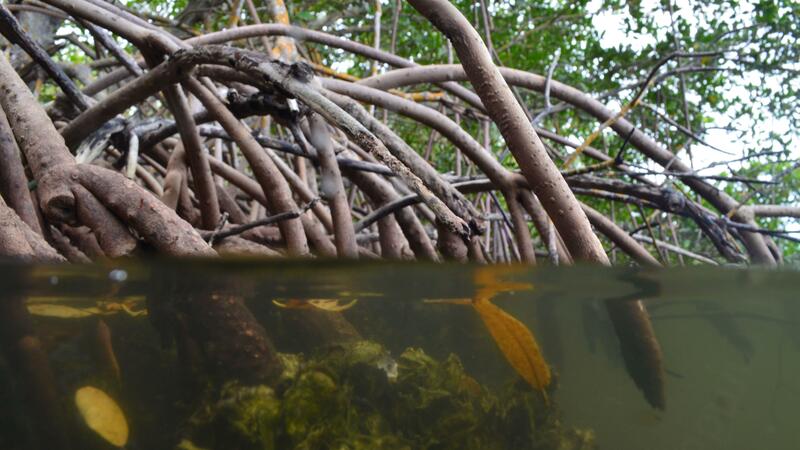 A lot of juvenile fish live among the mangrove roots, where there is plenty of food and they are protected from predators. 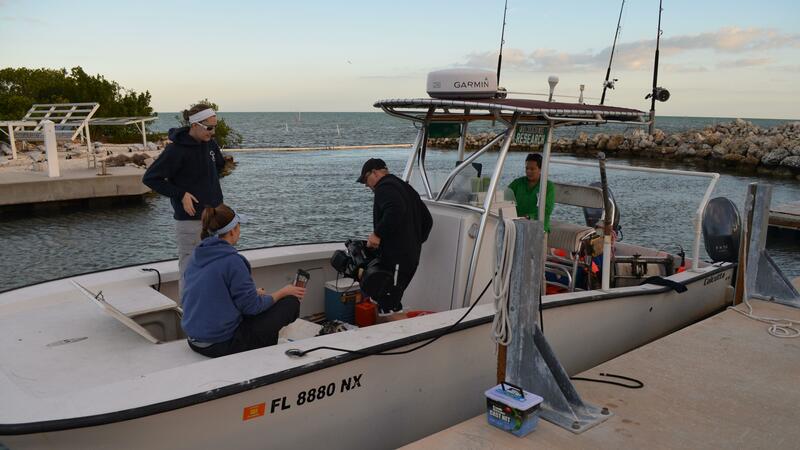 Scientists from NOAA’s Southeast Fisheries Science Center research juvenile sawfish near Everglades City, Florida. 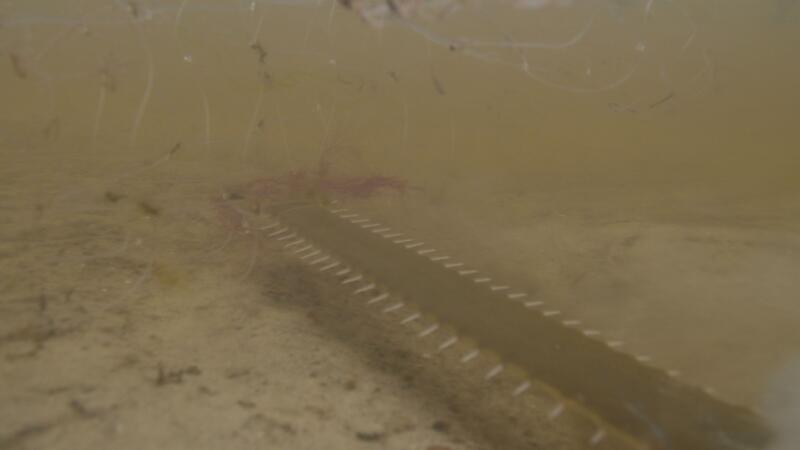 The sawfish rostrum easily ensnares in a gillnet. 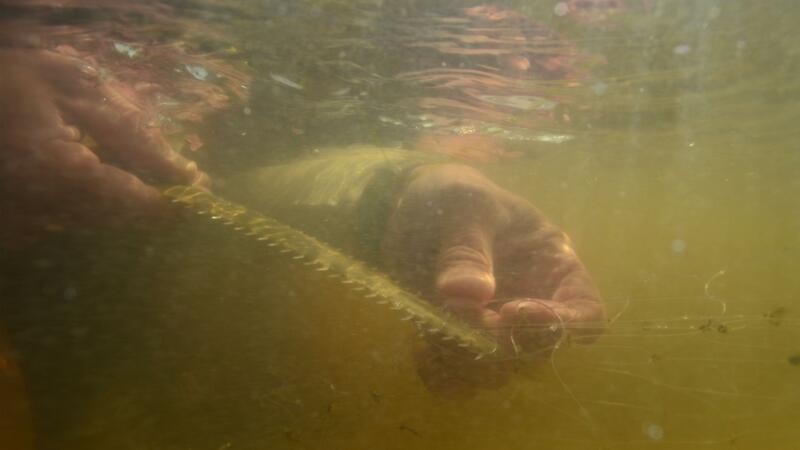 A juvenile sawfish caught in a gillnet. 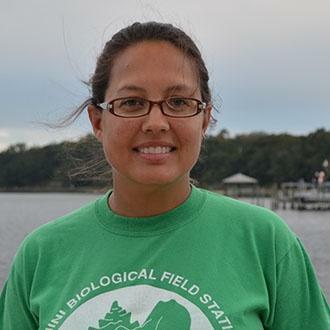 After a brief scientific workup, the animal will be released. 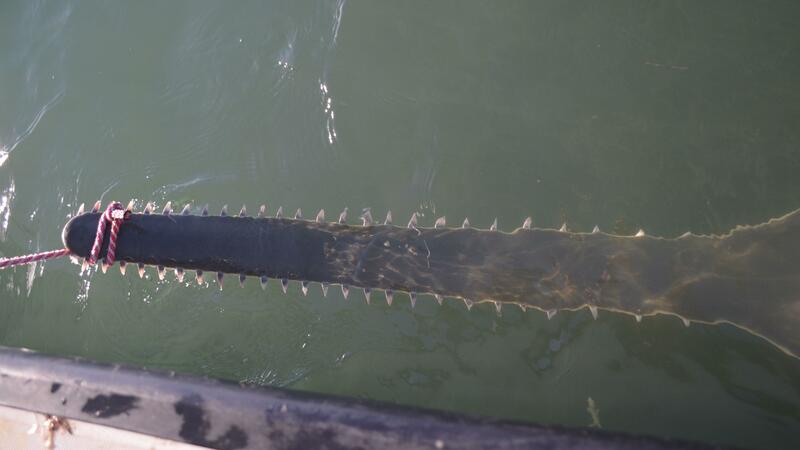 Once caught, the sawfish rest on the bottom where they can breathe normally. 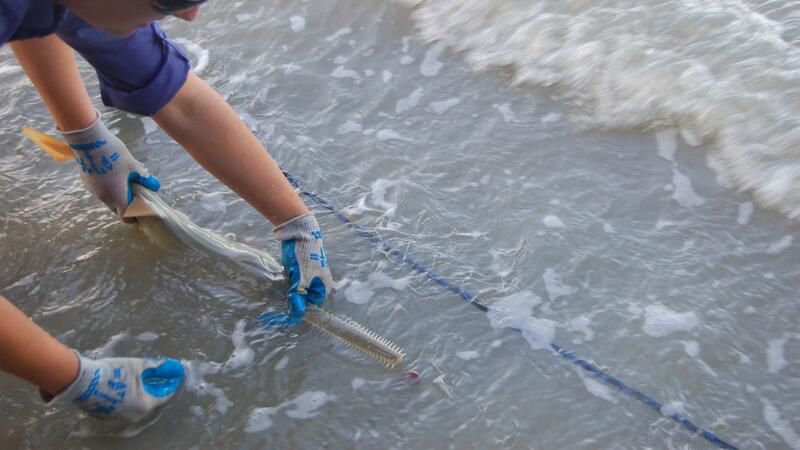 The scientists free the rostrum from the net so they can work up the sawfish. 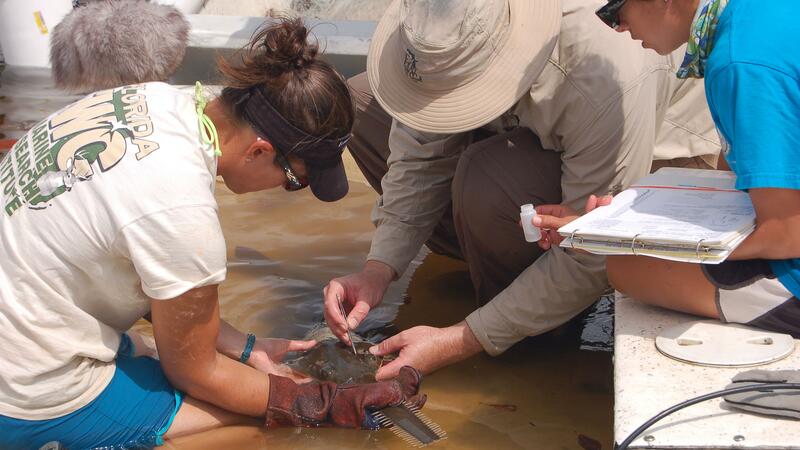 Each juvenile sawfish is outfitted with an external identification tag. 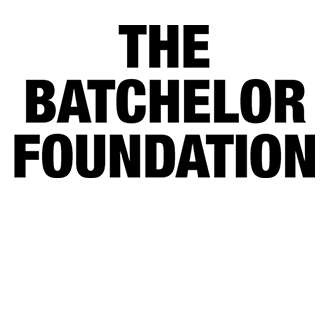 This helps the scientists identify the animal should it be re-captured at a later time. 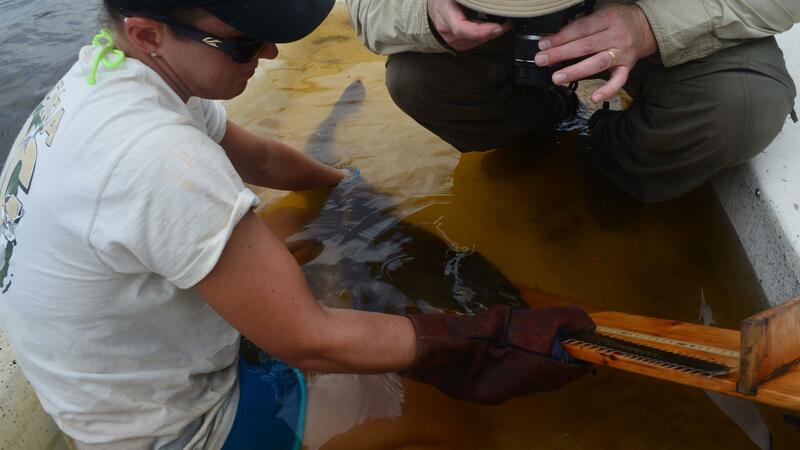 The sawfish are also outfitted with an internal tag that is similar to the ID chips vets use for pets. 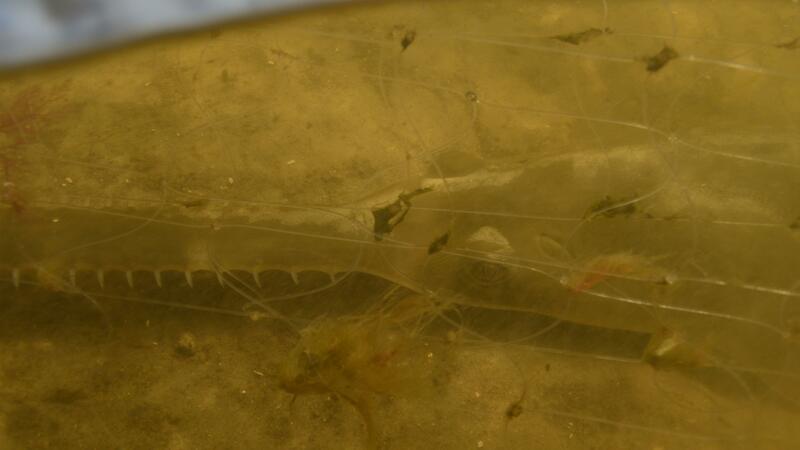 A juvenile sawfish caught in a gillnet. 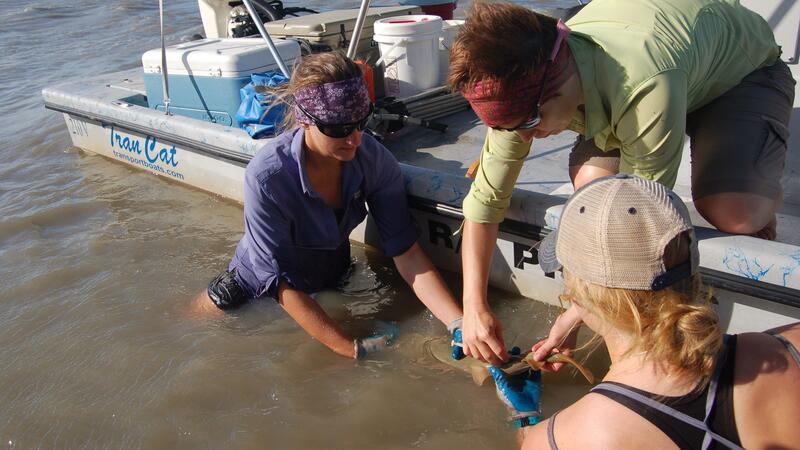 The scientists carefully untangle the rostrum from the net so they can work up the sawfish. This little guy is ready to be worked up. 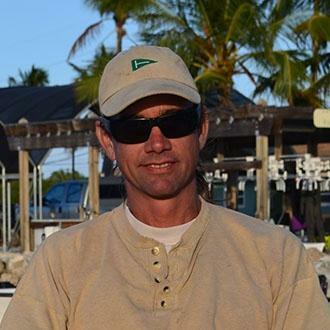 Dr. Gregg Poulakis and his team from FWC also use gillnets to catch sawfish. 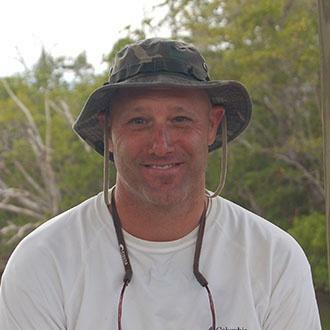 Dr. Gregg Poulakis and his team remove parasites from a sawfish. 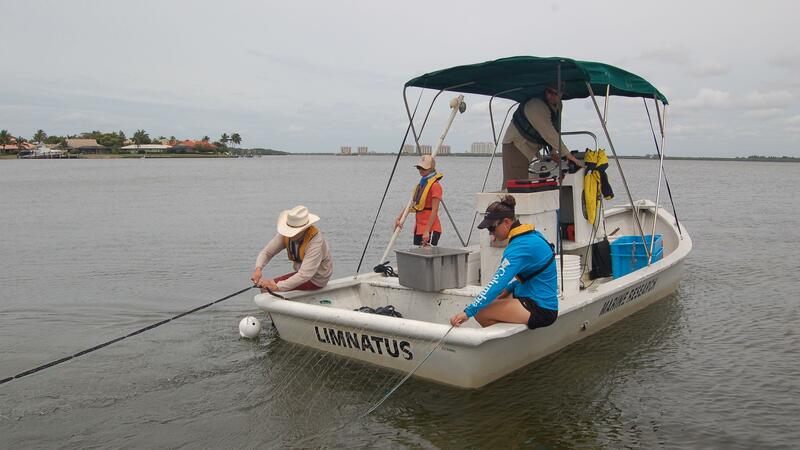 Mullet skiffs are ideal boats for sawfish research as the animals can be worked up safely in the net well. 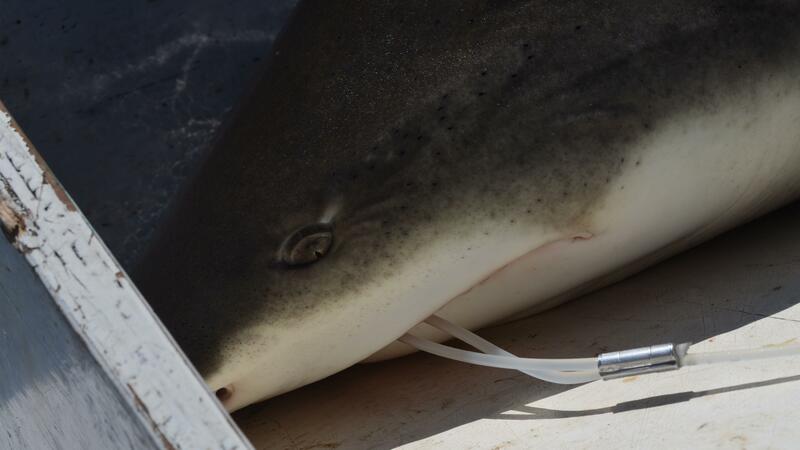 Among other things, the experts take measurements of the animals they catch. 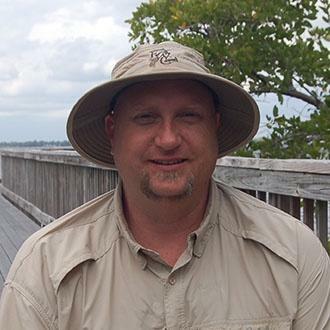 Dr. Gregg Poulakis takes a photo of the sawfish rostrum. 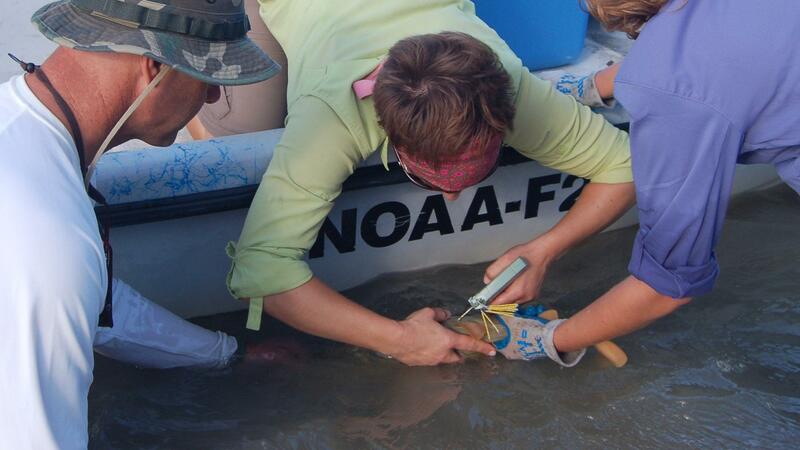 The Changing Seas crew captures the action as Dr. Gregg Poulakis and his team work up a sawfish. The NOAA science team, led by Dr. John Carlson, with cameraman Sean Hickey and Producer Alexa Elliott.